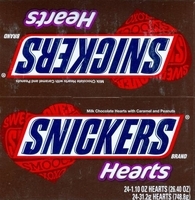 Buy snickers hearts for your Valentine. Just like a snickers candy bar you get caramel, peanuts, nougat all covered with real milk chocolate in the shape of a heart. These make the perfect Valentine's Day gift for anyone who loves chocolate candy. Each box has 24 1.1 oz individually wrapped Snickers Heart candy bars.